Got this one to use with my planer for a jointing sled ,works really well,seems to be well made and strong and is versatile with a single roller and also comes with the ball bearing set of rollers that is easy to change to with just a flip and locking latch ,, makes it adaptable to use with the table saw .and folds up for ease of storage .thinking of maybe another for the infeed end ,now using it at the outfeed end . Nice, Eddie! How often do you anticipate needing/using it? How much does the stand itself weigh? I concur, Eddie. I have one of those myself, and it is indeed well made and sturdy. I find mine very useful, and it is a good value at the price they’re sold for. The support roller that I use is the HD Rockler Flip top Roller Stand. The reason I got This one is that it has both a roller and ball bearing balls. The nice feature that it has it has 2 height adjustment screws. This allows one to make micro adjustments … loosen the lower one a little and the top one to allow the stem move down. The stem is also tapered which allows this micro adjustment possible. Another feature I like are the eccentric rubber caps on the end of the floor tubes that allows compensating for an uneven shop floor. They also provide a positive grip on the floor. The weight (30 pounds) adds to their stability. The weight capacity is 440 pounds. It is well worth the $69.99. Every now and then Rockler has them on sale which is the time to buy them. If you live near a Rockler store, check them out. Thanks for the review. Looks a little fancier than the one I bought from Menards a while back. I have the Kobalt and like it. Easy to adjust. I have a cheaper (cheesier) version of that, with just the roller. It is hard to lock the wing nut tight enough, and it is so light, that I have to weight it with 2 or 3 big sash weights to keep it from falling over of folding up. Sand bags would be good too. It is not my favorite support roller. This is a nice addition eddie. You’ll find you will use this time after time. 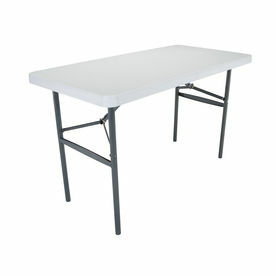 I like these 2’x4’ folding plastic top tables for about the same price. I stack the wood to one side as each piece comes off the planer. Use them for in and out feed for the planer and table saw, and any other various needs. Wood slides easily on the plastic. Fold up and put away when not in use.